Choice boats for rent in southern and eastern Vermont at rental centers, boat dealers, outdoor markets, and boat rental agent locations. Each offering a unique variety of watercraft for rent. Find jet skis, pontoon boats, fishing boats, family boats, canoes and kayaks. Some rental resources may also offer deck, ski and speed boat rentals. Listed below find boat rental dealers and other resources offering boats for rent for use on Chittenden Reservoir, Harriman Reservoir, Kent Pond, Lake Rescue, Woodward Reservoir, West River, White River and other waterways in Vermont. Rental locations are listed nearby cities and attractions. Cities listed include Springfield, West Brattleboro, Wilmington, Hartford and Randolph. Contact these boat rental services to see if they have the ideal boat for you to rent. Locate boat rental dealers and other boat rental locations within or nearby cities and attractions in eastern and southern Vermont. To enhance your boat renting experience, click here to locate resources for safety equipment, water toys and boating gear in southeast Vermont. 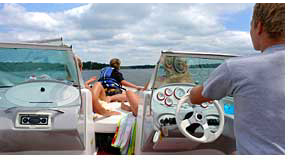 Enjoy boating in southeast Vermont with a rental boat that is designed to carry the members of your party. Boating safety classes are available in most areas to get you familiar with safe boating procedures. Some marinas may offer boat rentals for use on the lake where the marina is located. Check with Chittenden Reservoir Marina, Mountain Resort Marina or Scotts Landing for information on local boat rental options and recommendations.